I really want to get into the habit of trying new recipes more often. I'm thinking that will be one of my New Year's Resolutions this coming year, so why not start gearing myself up for it now. It's funny all of the cookbooks we have. Joe and I used to pick up a new cookbook almost everytime we went to Sam's Club while we were first living together so many years ago. Those cookbooks have gone neglected lately since Food Network has gotten so popular and recipes are so readily available on the Internet. Since I don't have a lot of free time since Gracie's arrival, it's difficult for me to find time to sit at the computer in the guest room to browse for recipes. So, while she's in her bouncy seat or her swing, I like to sit on the couch and flip through the pages of some of our cookbooks. The recipe I want to share today is from the Rival Crock-Pot Slow Cooker Cuisine cookbook. I'm thinking about trying this recipe this week. I'm sure that I will be making some changes to it (since I almost always change something in a recipe), but for now, I'll post it as it appears in the book. Cut beef into 1-inch cubes. Mix together flour, salt, and pepper. Dredge beef cubes in mixture. In a skillet, heat margarine and olive oil and brown beef cubes. Place browned beef in the Crock-Pot. Add remaining ingredients except for carrots. Add carrots and cook on Low 1 1/2 hours or on High for 30 minutes. I'll be linking this Crock-Pot recipe to Dining with Debbie's Crock Pot Wednesday. I will also re-post MY version of this recipe after I make it (later this week), either here or at My Vintage Kitchen (my food/kitchen related blog), so be sure to check back! After many weeks of posting menu plans that listed meals that we didn't get to the previous week, I decided to go without a menu plan this week to see what happens. My OCD personality, is giving me a bit of stress when I don't stick to the plan as posted and I feel that I am re-posting the same meals week after week. I'm thinking that a couple of weeks of winging it, will help me to get back on track, take inventory of my freezer and pantry, decide what to stock up on for the next couple of months and also decide on some new recipes to try. Today, I pulled a bunch of stuff from the freezer to thaw for meals, including the whole chicken that I've been planning to make the past few weeks but never got around to thawing. I'm thinking that I may be trying a new recipe with that chicken and also a new recipe for some diced London Broil. 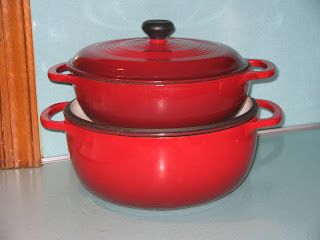 I'll be sure to post them either here on this blog or at My Vintage Kitchen (my food/kitchen blog). Also, today, I made enchiladas using a different filling than I've been using. We were really pleased with the results! What a wonderful way to use up leftovers and make a some room in the freezer for the FREE turkey we earned by shopping at Giant for spending a certain amount of money in a certain amount of time. I don't remember the details, but buying baby formula and diapers was a big help in earning us that FREE turkey. We'll be picking it up this week! I read about this great deal on Thursday night. Sadly, I cannot give credit to the wonderful blogger that posted the information because I was trying to cram a month's worth of blog reading into just a few hours...midnight to 3:00 in the morning...need I say more? At first, I wasn't going to blog about this, since I am usually the last to find out about great deals like this. But after asking my friend, Lisa, if she printed out her coupon, she told me she didn't know about it. Lisa is way more on top of things in the coupon department, so I figured if she didn't know about this great deal, then maybe my readers don't know either. Just in time for the holidays...a printable coupon for $10 off Disney's UP DVD/Blu-Ray Combo Pack. Be sure to act quick since it expires SOON. November 17th, I think. Also, shop around....I saw this at Target today for $26 and some change (can't remember exactly-I just knew it was more than I wanted to pay even after the coupon). Shopping at Walmart later, I paid $9.99 for it after the coupon! Don't forget, you can print this 2 times per computer. Buy one for a gift and keep the other for yourself! 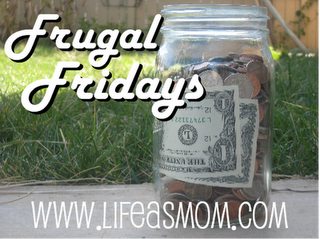 Today is Frugal Friday over at Life As Mom. Be sure to check it out for great money-saving ideas! Even before the Food Network days, I've loved all stuff kitchen related: gadgets, dishes, cookware, etc. When we lived in our apartment, I kept promising myself that when we finally bought a house, I would buy myself a fancy Le Crueset Dutch Oven. I could have bought one sooner, but I didn't want to waste it on that awful apartment kitchen. So, we finally found and bought a house and I quit my job since it was too far to commute. We made the decision that I wouldn't return to working and we'd start a family. Well, with the lost income, I couldn't bring myself to keeping the promise I made to myself. Have you seen the prices of those things? Even though I couldn't rationalize the cost, I still wanted one. I really, really wanted one. Okay, I wanted an entire set, but would settle for one. One day, I was in Walmart. It was after Christmas and a lot of their stuff was marked down. Not just holiday stuff. They are made by Lodge. They are enamel-coated, cast iron dutch ovens. They are super-heavy and look really nice. And they are RED! They were perfect and marked down from their regular price! I really wanted the larger one (6 quarts), but sadly, I had to leave Walmart that day without them. We just didn't have the money for them that day, since it was so soon after the holidays. We had to stick with just the neccessary items on our shopping list that day. I went home and just knew that they wouldn't be there by the time we had the extra cash. But after a couple of trips to Walmart (again for just neccessities), we finally had some extra money. I happily put the large one (6 quarts) into our shopping cart! A few weeks later, they still had the smaller one (3 quarts) and it was still marked down and I just had to have it! Now, I don't remember the actual price I paid for each of these, but I do know that the the cost of both of them if they weren't on clearance wasn't even near the price of one of the actual Le Creuset pots. Williams-Sonoma currently has a 5.5 quart Le Creuset dutch oven ON SALE for $230....that's the SALE PRICE!!! It's regularly $310. At Walmart, you can get a 6 quart Lodge Color Enamel dutch oven for $65.97. Like I said, I was lucky enough to get this size and the smaller size (3 quart) on a clearance sale, but even at the regular price, it's a steal! And since I've never cooked in a real Le Creuset pot, I have no idea if it's the same or not, but I don't think I am missing anything since I love to use my Lodge pots. They are really great at keeping food warm. I can start a soup or stew early in the day and when it's done cooking the pot keeps it warm until dinner time! And they clean up easily too! I'm a little late for REDnesday, but didn't want to wait for next week to tell you all about the adorable dress I bought for Grace! On Monday, I spotted this sweet little dress on a clearance rack at Target. It was the only one of it's kind and I was super lucky that it was Grace's size! Love the red courdiroy and the 1/2 off price tag! This will be perfect for Grace to wear on her first Turkey Day, don't you think? 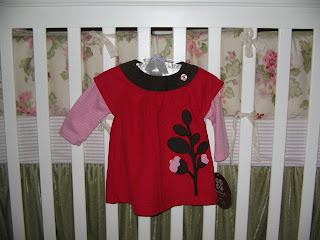 To read about more RED stuff, head over to REDnesday hosted by Sue at It's a Very Cherry World! Last week, I did really well following my menu plan. I never did get around to thawing the whole chicken for the crock pot, so that will get rolled over into this week's plan. A great way to serve leftover spaghetti is to fry it. Especially, when there isn't a lot of leftover sauce. When we have spaghetti (with meat sauce or plain sauce) for dinner and there is some left, I pack away the leftovers in the same container. Usually by the next day, the pasta has absorbed most of the sauce. Rather then opening another container of sauce (jarred or from the freezer) I will put the leftovers into a frying pan and fry it up until it's heated through. I like it to go a little longer than that and let some of the noodles get a little crispy! My parents used to do this all the time when I was a kid and it's especially good with meat sauce. But the plain sauce works too! When my husband fries the spaghetti, he adds butter to the pan. I don't think that the butter is needed and prefer it without. Also, today, I want to share a free sample link that I found in my weekly email from MySavings.com. Click the icon below to sign up for your free sample. I'm not a coffee drinker myself, and hubby doesn't drink Dunkin' Donuts coffee, but the sample could make a nice addition to a small gift since the holidays are coming! Today, over at It's a Very Cherry World, it's REDnesday! 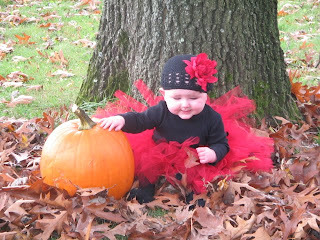 My favorite red item is my baby, Grace, dressed in her ladybug Halloween costume! Isn't she cute?! I had a heck of a time getting a good picture of her. My camera is super slow and she doesn't sit still for very long! Not only is this my first post to Rednesday, it's also my first post to include a picture! I'm not much of a photographer, so you'll have to excuse the bad photos! But you have to admit, the model is super cute! I really love the way her costume turned out! 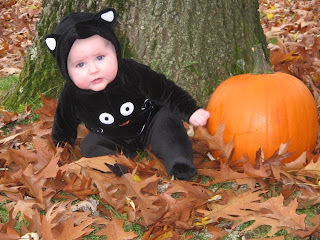 The black onesie was purchased from Babies R Us. Her black tights were purchased from Kohl's. 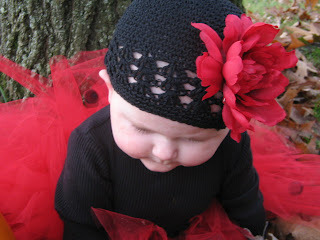 Her beanie and red peony flower clip were ordered from Lemon Drop Baby Boutique's Etsy Shop. 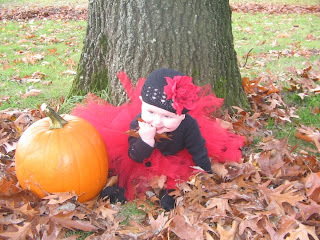 Her ladybug tutu was ordered from Pampered Princess Boutique's Etsy Shop. Wow! 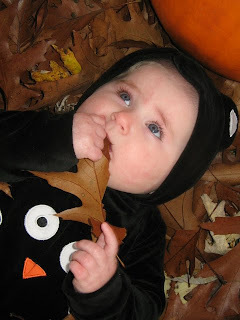 How odd it feels to type "November"~ don't ya think? This year has gone by so fast...too fast! Last week, I did much better in following the meal plan. I still strayed a bit due to some lingering chaos from being sick for a week and a half. But we avoided take-out and finished up most of the leftovers in the fridge. This week, I am in a cooking mood. At least at this very moment. Last time I claimed to be in a cooking mood, I got sick and didn't manage to follow my menu plan at all! Hoping things go as planned this week! Monday: Meat Loaf, sour cream mashed potatoes, brown sugar-glazed carrots and onions. Friday: Spaghetti with Meatballs and Kielbasa. Saturday: My Birthday...undecided about dinner...maybe some Chinese take-out. Sunday: Crock Pot Chicken, Scalloped Potatoes, Green Bean Casserole. Be sure to check out my other blog, My Vintage Kitchen. I'll be posting some recipes there this week. Look for my recipe for meatloaf, veggie pizza, & scalloped potatoes. Also, I may be trying a new recipe for Crock Pot Chicken and if I do, I'll post the recipe after I make it. I'll also be sharing my recipe for Fudge. It's really easy and makes a great gift during the holidays...or whenever! For more menu planning inspiration, check out Menu Plan Monday hosted each week by I'm an Organizing Junkie.